1 0 P R I N T W E A R J A N U A R Y 2 0 1 9 BUSINESS WATCH 1 0 P R I N T W E A R J A N U A R Y 2 0 1 9 1 0 P R I N T W E A R J A N U A R Y 2 0 1 9 Industry Updates FARGO, N.D.—Heat Transfer Warehouse launches Heat Transfer Clothing, a new division of the company on a separate website. 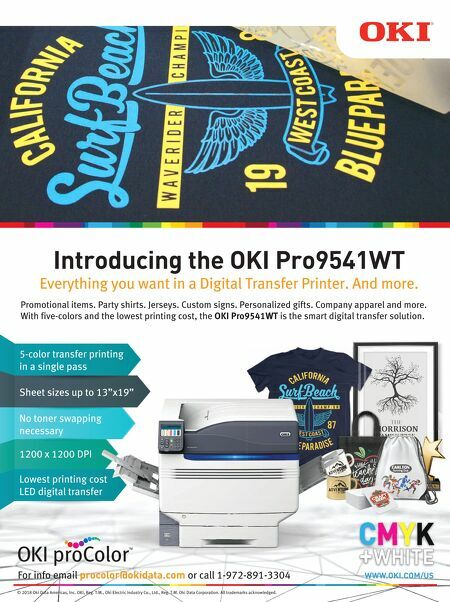 The website features a variety of blank clothing intended for decoration with heat transfer vinyl and sublimation. The company offers a selection of cat- egories including business, athletic, outerwear, workwear, headwear, and bags and accessories. To view the website, visit www.heattransferclothing.com. LACONIA, N.H.—Madeira USA announces the launch of a newly designed website. The new site offers users educational videos, webinars, Pantone color matching, online shopping and a wish list feature for future orders. In addition to an updated look and design, the new website features a redesigned Specialty Test Design section with free, downloadable designs that are digitized specifically for various specialty threads. For more information, visit www.madeirausa.com. MIAMI—Ricoma's COO Henry Ma introduces Garmeo, a platform that routes customer orders to embroidery business owners, set for launch on Jan. 18, 2019. Customers upload custom designs and order details with the platform's editor and Garmeo's algorithm routes the order to the nearest embroidery vendor based on the vendor's capability, avail- ability, and stock. Built-in management features for business owners include invoicing, inventory management, logistics, and shipping. The official launch date is Jan. 18, located at www.garmeo.com. 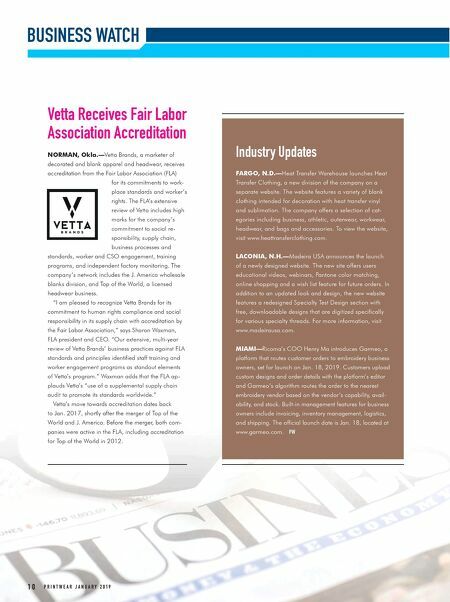 PW Vetta Receives Fair Labor Association Accreditation NORMAN, Okla.—Vetta Brands, a marketer of decorated and blank apparel and headwear, receives accreditation from the Fair Labor Association (FLA) for its commitments to work- place standards and worker's rights. The FLA's extensive review of Vetta includes high marks for the company's commitment to social re- sponsibility, supply chain, business processes and standards, worker and CSO engagement, training programs, and independent factory monitoring. The company's network includes the J. America wholesale blanks division, and Top of the World, a licensed headwear business. "I am pleased to recognize Vetta Brands for its commitment to human rights compliance and social responsibility in its supply chain with accreditation by the Fair Labor Association," says Sharon Waxman, FLA president and CEO. "Our extensive, multi-year review of Vetta Brands' business practices against FLA standards and principles identified staff training and worker engagement programs as standout elements of Vetta's program." Waxman adds that the FLA ap- plauds Vetta's "use of a supplemental supply chain audit to promote its standards worldwide." Vetta's move towards accreditation dates back to Jan. 2017, shortly after the merger of Top of the World and J. America. Before the merger, both com- panies were active in the FLA, including accreditation for Top of the World in 2012.